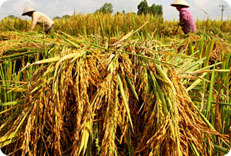 Hanoi, Mai Hich, Phu Yen, Than Uyen, Sapa, Bao Thang, Yen Bai, Hanoi. 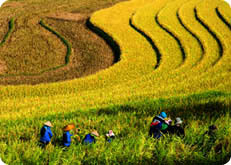 North West Vietnam offers intriguing and beautiful cultures, the stunning landscape of terraced rice paddies, the colourful world of Hmong and Dao people with their distinctive red and black dreess. 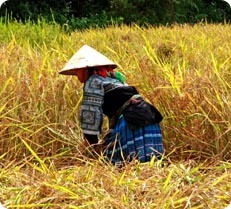 We hike and trek through particularly picturesque areas, cycle around beautiful villages and are guests in small White Thai, Hmong, Tay and Dao villages. Come with us and live it. 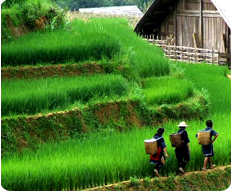 Departing Hanoi we take a spectacular ride through fabulous countryside to Muong Khen, a magical valley where we hike around beautiful villages and along a track which winds its way through sculpted rice terraces and along the towering mountains. Shortly after lunch we embark on a hike into the forests and mountains, past White Thai villages where we are the privileged guests of our White Thai hosts in the village of Mai Hich, staying in their traditional wooden stilt-house and experiencing their village lifestyle. (Lunch and dinner are included). 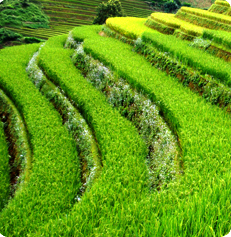 A further hike takes us through beautiful region which is easily explored by foot or bicycle. 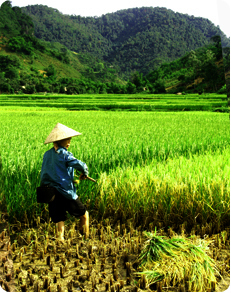 We find peaceful and friendly villages scattered along the way and we have the chance to appreciate the laid-back pace of White Thai life, visit a local morning market and learn about hand-spun weaving, before we continue on to the small town of Phu Yen, nestled in a valley. The night is spent in a comfortable hotel. (Breakfast, lunch and dinner are included). 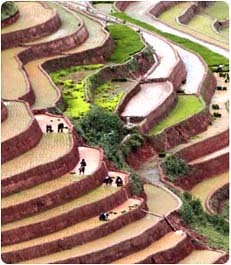 We spend a full day travelling to the beautiful sculpted rice terraces of Mu Cang Chai. 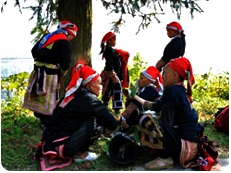 This ride is superb with fantastic scenery passing us by as we wind our way through mountain valleys and along the mountain range of Hoang Lien Son, we discover the villages of the many different ethnic minority groups of the region. 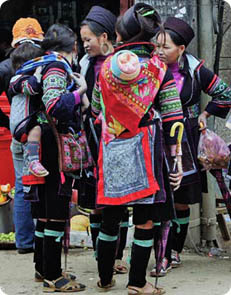 The colour of the local market is breathtaking, with some ethnic minority people in their traditional dress. We conclude our day in Than Uyen, a fascinating little market town. At night we stay overnight in a friendly hotel. (Breakfast, lunch and dinner are included). 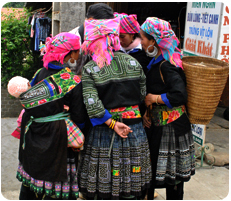 Sapa has so much to offer, the mild climate, beautiful scenery and colourful minority groups. Departing Than Uyen we take a short drive to Sapa, followed by a scenic trek into the hills and through tiny vilages, inhabited by Black H'mong people. 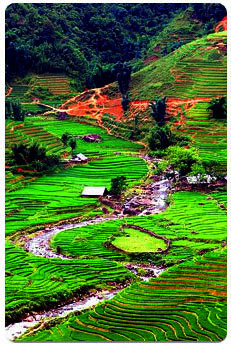 Finally, we reach the delightful town of Sapa. 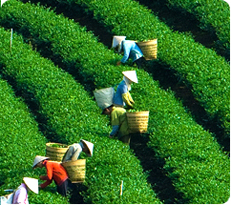 Spend the rest of our afternoon exploring Sapa's market and appreciating the town's charm and serenity, before our overnight stay in a comfortable hotel. (Breakfast and lunch are included). 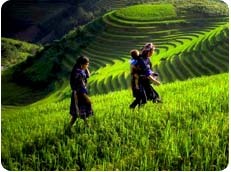 Nestled in a magical valley, Sapa offers the opportunity for fantastic hikes into the mountains and nearby villages, we escape the crowds on a trek into beautiful villages of Thanh Kim and Thanh Phu, where scuplted rice terraces are set among dramatic mountains and home to Tay and Dao people. 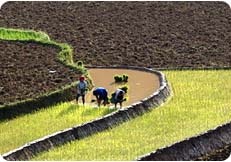 We have the chance to see how they live and gain a glimpse into their way of life. 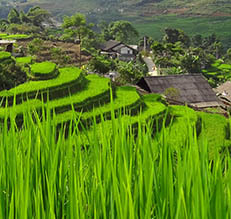 Finally, we arrive in our beautiful destination, the village of Sin Chai, surrounded by incredibly lush hills and fantastic rice terraces. 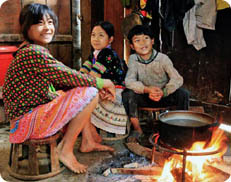 Tonight we spend a night in the traditional house of a Dao family to experience their lifestyle. (Breakfast, picnic lunch and dinner are included). 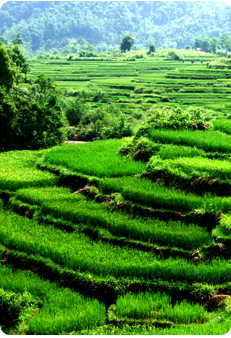 Departing Sin Chai we continue our adventure as we trek through verdant hills and among picturesque rice terraces to Suoi Thau, home to a magical valley and a Red Dao community. 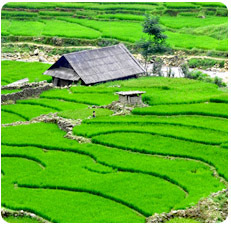 The trek is very much off the beaten track and offer many wonderful locations en route. 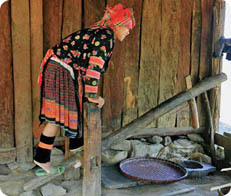 We reach Bao Thang, a little fascinating town. Here, we retire to a comfortable hotel for the night's rest. (Breakfast, lunch and dinner are included). 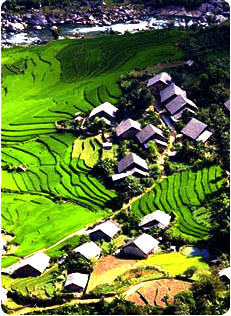 We take a drive to the township of Yen Bai. Here we embark on a scenic boat trip along Thac Ba lake. This is followed by a leisurely hike around nearby villages. It is an opportunity to take in the brilliant views. 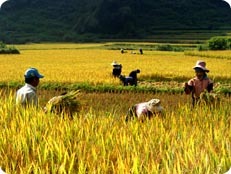 This is folowed by our final journey back to Hanoi, arriving there at about 5pm. (Breakfast and lunch are included). - a 8-10 km hike on Day 1. - a 2-4 km hike on Day 3. - a 4-8 km trek on Day 4. - a 12-14 km trek on Day 5. - a 16-18 km trek on Day 6. - $528USD per person for a group of 2 to 5 people. - $475USD per person for a group of 6 to 8 people. 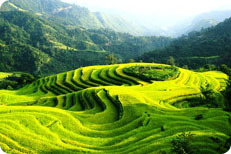 Pack essentials for 7 days away from Hanoi, including light comfortable clothes suitable for outdoor activities, trekking shoes, small day pack for cycling, walking, hiking and trekking.